How to Report on Refugees and Migration? 2012 has registered the highest number of refugees and internally displaced people than at any time since 1994, according to the latest data published today by the UN Refugee Agency (UNHCR). They report that more than 45 million people were displayed last year. The coming Refugee Day, 20th June, has led to an increase in the number of articles in the media covering this topic, especially due to the conflict in Syria, which has emerged as a major new factor in global displacement. Several official studies and reports have addressed the question of how to report on refugees and migration and analysed the mistakes that journalists make when they cover this issue. For example, one of the bad practises among the media is that “little coverage is given to the human rights abuses and conflicts that force people to flee their homes, yet providing this global context would improve the quality of debate around asylum issues”. This is one of the conclusions of Reporting on Refugees: Guidence by & for Journalists, a study published by National Union of Journalists in Dublin. UNHCR stated that war remains the dominant cause. A full 55 percent of all refugees listed in its report come from just five war-affected countries: Afghanistan, Somalia, Iraq, Syria and Sudan. Inaccurate terminology and commentary have also increased confusion; leading to prejudice. Frequently the words ‘refugee’ and ‘asylum seeker’ are used interchangeably, without distinction. The report Asylum Seekers, Refugees and Media Briefing published by the Information Centre about Asylum and Refugees (ICAR) points to the same conclusion. ICAR analysed the UK media finding that journalists do not distinguish between migrants, asylum seekers and refugees. They also denounce the bad practice of providing inaccurate figures. “Press articles and broadcast programmes contain expressions such as “thousands” or “hundreds” of refugees, which do not demonstrate a fair and balanced way to report about migration and humanitarian issues, nor do they make any reference to available statistical data. Precise data is crucial when talking about information on asylum seekers and refugees”. The UNHCR has a website with statistical data available for any country. They provide data, reports, maps, and statistical information for field operations, and also statistical reports on refugees, asylum-seekers and returned refugees. The ICAR report reveals also that refugees and asylum seekers who have been victims of harassment feel strongly that the press presents hostile images of asylum seekers and refugees and that those increase the likelihood of local persecution of individual asylum seekers and refugees. The report suggests that “the best way to contrast the misrepresentation of refugees and asylum seekers is by pushing for their integration into mainstream media in order to have representatives from refugee backgrounds in the industry. This leads to the production of more diverse information and policies aimed at engaging different audiences”. Furthermore, The Media for Diversity and Migrant Integration Project (MEDIVA) has compiled the codes of practice and ethics of journalists in 27 EU members’ states in order to identify relevant ‘non-discrimination’ provisions that reporters should follow. MEDIVA seeks to strengthen the capacity of the media to reflect the increasing diversity of European societies and thus foster a better understanding of immigrant integration processes at a time when social cohesion and integration policies are put to the test by an acute economic crisis. On the other hand, the Migrants’ Rights Network awarded this year examples of outstanding media coverage of refugee and migrant women in the UK. They looked for stories that challenged myths and stereotypes, and explored new angles on women and forced migration. The winner in the print category was Zoe Williams for her article in the Guardian ‘Evicting asylum seekers? We just follow orders’. The winner in the online category was Len Grant for the blog Life Without Papers, which shines a light into the hidden lives of undocumented families. The winner in the broadcast category was Jackie Long for her report for Channel 4 News on chaos in the UK Border Agency and the impact that this has had on one individual refugee woman. 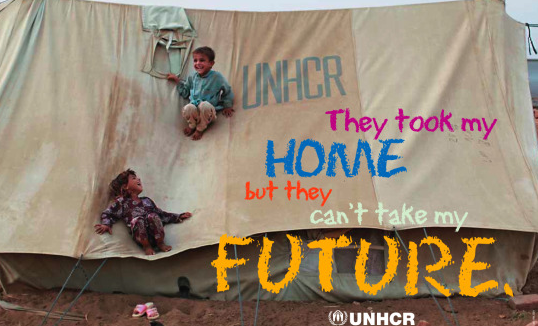 To mark Refugee Day, UNHCR has launched a campaign ‘If your family had just 1 minute to flee, what would you take?’. For example, Magbola Alhadi (on the photo) chose to bring with her a pot when her and her children were forced to flee after soldiers came and opened fire on their village.“It was small enough to carry on their 12-day journey, yet big enough to cook for her family”.